Shown above: 1 East Side Table, 1 Valhalla Club Chair, 1 Valhalla Loveseat, 1 Billi Side Table, 1 Jimmy Side Table, and 2 Jelli Ottomans. Wonderful whimsy has never been more contemporary. Get ready to enjoy ultimate relaxation in the amazing Valhalla Outdoor Wicker Collection. An outstanding blend of state of the art materials are coupled with a classic and stylish design that oozes elegance and luxury while still being welcoming and inherently cozy. The Valhalla Outdoor Collection is made up of just two key pieces; the amazing cushy 3 Seat Sofa and the Valhalla Club Chair, giving you the pieces to create a vast outdoor deep seating unit or just a piece or two to propel you into comfort! 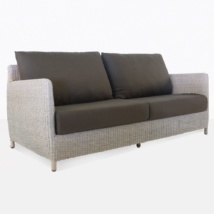 The wicker is a soft blend of light brown and white tones. Traditional and classic designs helped us form Valhalla into a timeless shape that everyone loves! Rounded edges are met with large surfaces of slender woven wicker, in a wide seating unit that is dressed with thick, bountiful Sunbrella® cushions. Imagine your pergola, nestled in amongst the garden, waiting for the right pieces of outdoor furniture to make it a retreat to relax, rejuvenate and rejoice… Place the Valhalla Outdoor Wicker Sofa facing the garden, a gorgeous Valhalla Club Chair on either side with a beautiful coffee table out in front, such as our Havana Coffee Table for the greatest blend of wicker and wood. You’ll adore how welcoming and stylish this suite really is! Our Valhalla Collection is built on a powder coated aluminum frame to protect it, keep it strong and you comfortable. It is then wound tightly with outdoor wicker, a polyethylene through-dyed material which does not melt, morph or change color outdoors while looking incredible. Finally, Sunbrella® cushions sit atop the seats to bring you optimum comfort and style. Sunbrella® is the best fabric for outdoor use, as it protected from most elements… this is a fabric you won’t see fade! And best of all, the cushions are free with purchase! Teak Warehouse is proud to bring you the divine Valhalla Collection, to order yours today, call in, call up or email us – our sales staff are in store daily to help you find the best outdoor furniture for your space!